Our concept fleet gives us the flexibility to showcase our innovation practically anywhere, and we are excited to unveil Limitless and Hercules here at CES,” said Matt Fidler, co-founder and chief marketing officer for Furrion. Furrion, a global leader of innovative products and solutions, today debuted its new concept vehicles, Limitless and Hercules, at the 2018 Consumer Electronics Show (CES). Limitless, a customized fifth wheel, and Hercules, a futuristic semi-truck, join Elysium, the motorhome complete with a hot tub and helicopter on top that Furrion introduced at CES2017, to complete the concept fleet. All three vehicles are outfitted with the latest in technology, combining smart living solutions with sophisticated design for a luxury mobile lifestyle experience. As a leading innovator in consumer electronics and energy systems for recreational vehicles, yachts, hotels and homes, Furrion showcases the company’s smart technology with their new fleet of luxury vehicles. Limitless is a fifth wheel like no other. It is 41 feet long and 8 feet wide and features six slide outs that will expand the RV to 350 square feet of living space. Limitless it towed by Hercules – a futuristic semi-truck that boasts 22 torque of towing capacity and features its own luxury living quarters behind the main cab. When paired together these two vehicles create a connected living experience that redefines luxury mobility. Stepping into Limitless is like stepping into a luxury hotel suite or apartment, as you enter with views of a professional kitchen straight ahead and a luxury living room to the right. The kitchen is any home chef’s dream, complete with a full suite of stainless steel appliances, including a full-sized side-by-side refrigerator, built-in oven, gas cooktop and hood, convection microwave, induction cooktop island and a compact dishwasher. It wouldn’t be luxury living without the 48 bottle wine fridge that can also double as extra food storage space when you have guests. The living area is perfect for entertaining, with its spacious layout and a 65-inch smart TV and multi-zone Furrion entertainment system that allows you to control the content with a touch of the remote throughout the RV. Adding a unique touch is the 40-inch electric LED fireplace, which not only has adjustable temperature controls to heat the entire space but also allows you to change the color of the life-like flame simulation from orange to red to blue depending on your preference. On the other side of the kitchen and dining area is the bedroom quarters, complete with a king-sized bed and a 39-inch smart TV and entertainment system for relaxing. No detail was spared and that includes the smart bathroom facilities. The bathroom features a digital tap, a smart shower complete with smart temperature controls, steam functions and Bluetooth speakers, a Furrion smart toilet and an smart mirror. The Furrion tankless water system that Limitless features ensures there will always be hot water on demand. While the inside is luxurious, the outside of Limitless is just as high-tech. An omnidirectional antenna ensures you will be able to receive TV, Wi-Fi and Furrion’s new 4G data network, which is rolling out on RV’s in the USA later this year. The antenna includes digital signal boosters to provide Internet connectivity in even the most remote areas, so you can always be connected. A Furrion 58-inch smart TV and entertainment system on the outside of Limitless allows you to take entertaining outdoors. Because safety and security are always a top priority, Furrion has outfitted Limitless with its Vision S video surveillance system, which has four exterior cameras and a seven-inch touch display that allows for monitoring. The cameras offer up to 50 feet of viewing (day or night, with infrared night vision) and have both microphones and motion sensors. For added peace of mind, users can set the device to alert them if there is motion outside. When Hercules is towing Limitless, the cameras can sync to another seven-inch touchscreen display inside Hercules’ cockpit, transforming the vehicle into a constant observation system for driving and maneuvering. Hercules got its name due to its sheer size and strength, but it definitely has a softer side as well. Behind the cockpit are compact living quarters with a luxury feel. There you will find a bedroom and a living space with a 24-inch Furrion TV, a Furrion infotainment system, a compact refrigerator and microwave. In the living quarters, occupants can gaze at the stars through the moonroof on top. Keeping with Furrion’s mission for smarter power solutions, Hercules is also fitted, with a 100W solar panel and lithium-ion battery system that can power the compact living quarters when the generator is turned off. Hercules boasts many unique details that are not included in a traditional semi from the observation system to the one-of-a-kind moon roof, careful detail was taken to ensure an exclusive experience. When towing Limitless, Hercules’ living space can be used as an additional bedroom, allowing more people to enjoy the adventure. 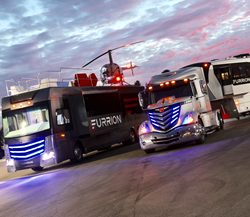 All three of Furrion’s concept vehicles will be on display at CES in booth 30768 in the South hall and then will continue to tour the US at various events. When not on the road, Elysium, Limitless and Hercules reside at Furrion’s Innovation Center and Institute of Technology in Elkhart, Indiana.